Apple has been criticized by iPhone 4 users and media for the reception problems that seem to result from its faulty antenna design. While all cellphones experience a decrease in signal quality when you touch their antenna, the iPhone 4 design puts the antenna all around it, making difficult to avoid under natural handling of the phone. Cases started to appear in MacRumors.com and Gizmodo.com on June 23, one day before the official launch of the iPhone 4, from users who received their units earlier. After those initial reports, thousands of users started to report reception and transmission problems in different countries around the world, which resulted in loss of internet connections and voice call drops and voice quality degradation. Other tests have demonstrated the antenna problems since then. Click to viewThe lawsuit was filed by Ward & Ward, PLLC and Charles A. Gilman, LLC. on behalf of Kevin McCaffrey, Linda Wrinn and a number of other iPhone 4 users. It is not the same iPhone 4 class action lawsuit currently said to be in the works by the California law firm that sued Facebook and Zynga. • Goodglick v. Apple is filed by Kershaw, Cutter & Ratinoff LLP in the Northern District of California. • Ngyuen v. Apple is filed in the Southern District of Texas. 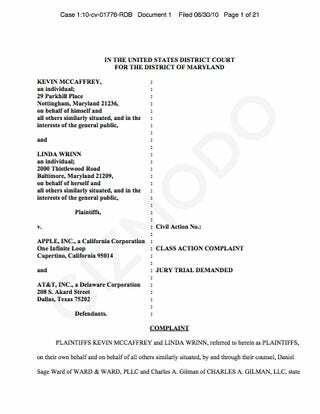 • McCaffrey v. Apple is filed in the District of Maryland. • Benvenisty v. Apple is filed in the Northern District of California. • Dydyk v. Apple is filed in the Northern District of California.